Sometimes I will put the pig’s tail into my brawn, as it’s a good way to incorporate it into a dish. 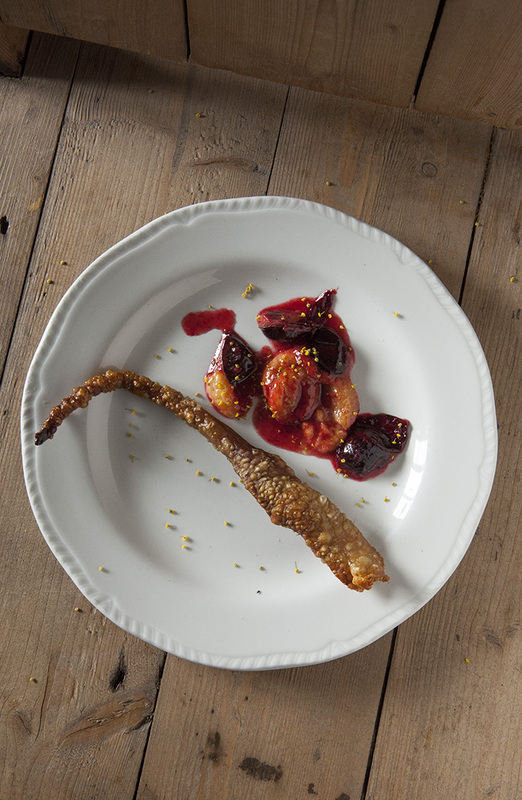 But sometimes I’ll serve it solo – crispy and crunchy – with a damson or plum compote. It’s fun, and I find people always enjoy eating something a little unusual. First you need to remove most of the bone from the tails. Place one on a board and split it down its length with the point of a sharp knife. You don’t have to go all the way to the tip of the tail, just about halfway down will be fine. Now carefully trim out the bone from within by tracing the knife around it. The thinner section of tail bone can be left in. Repeat with the other tail. Place the boned tails in a pan of boiling water and simmer for 45 minutes–1 hour. Remove them from the pan and allow to steam off in a colander while you preheat the oven to 200°C/Gas mark 6. Place the pig’s tails on a baking tray. Season with salt and pepper, and trickle over some olive oil. Roast in the oven for 25 minutes or until crisp and crackly. Put the damsons into a small pan with the sugar and butter and cook gently over a medium-low heat for 3–4 minutes until just starting to soften. Taste and adjust the sweetness if necessary. Serve a spoonful of the damson compote alongside each tail. I like to scatter over a few fennel flowers if I have them – they add a lovely aniseedy twang. The small amount of bone left in the tail becomes tender enough to crunch up, so you can eat the whole thing.